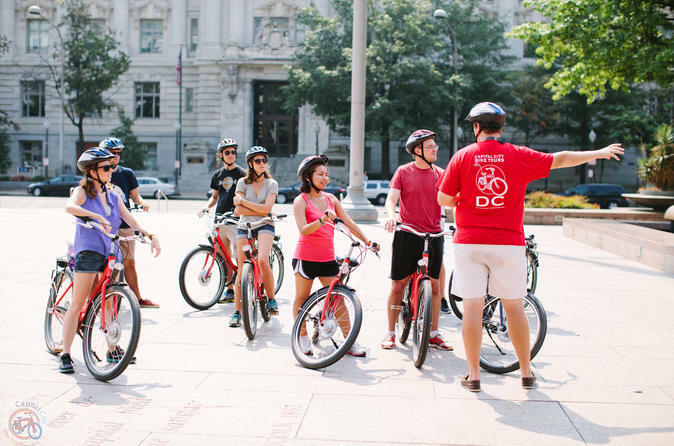 Explore the famous landmarks and monuments in Washington, DC on this guided, 3-hour bicycle tour. Pedal around the nation's capital, visiting the White House, the Lincoln Memorial, the Washington Monument, the Vietnam Veteran's Memorial, the US Capitol Building and much more. Along the way, hear fascinating stories about presidents and Congress, memorials and parks, spies and scandals. A helmet and bike are included. This 'Daytime DC Bike Tour' begins at 502 23rd Street NW in Washington, DC. Meet and greet the tour guide and the rest of the group and gear up for the ride with a comfortable helmet and bike. Travel through the city, visiting points of interest like the the White House, the Lincoln Memorial, the Washington Monument, the Capitol Building, the Smithsonian Castle, the Korean War Memorial, and the Vietnam Veteran's War Memorial. Also, see the World War II Memorial, Pennsylvania Avenue, the Thomas Jefferson Memorial, the Eisenhower Executive Office Building, the National Mall, and many more — all on smooth and relatively flat terrain. Along the way, learn new facts and stories about Washington presidents and Congress, memorials and parks, spies and scandals. For the DC veteran or the visiting newcomer, there's something for everyone.